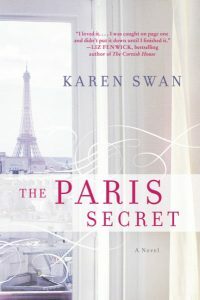 A little bit of art, a little bit of romance and a little bit of intrigue so makes up The Paris Secret by Karen Swan. TLC Book Tours sent me a copy at no charge for my honest review. I am always attracted to a book with art at its center. I was an art history major in college and I still have a passion – especially for the Impressionists. I am sure that many of you, like me, read the story of the apartment in Paris that had remained untouched for decades after the second World War. That story has a mystery and romance about it without even knowing anything more. I think that leaving it up to the imagination leads to so much more than the reality as remarkable as that was. The Paris Secret takes that story and builds another. The mystery is still there and the romance comes but this tale is so much more. It is really all about the art. Flora lives for her job of sourcing fine art. So much that she really doesn’t have any other life; she is always on the road seeking, researching, learning and identifying. The place she calls “home” is her parent’s house and she is very rarely there. This latest assignment has her trying to find the provenance of the paintings in this lost apartment. The heirs want to sell the paintings but can’t do so until their ownership can be verified. The one son, Xavier does not want Flora to be successful and tries to call her off but she is not working for him so she continues in spite of him. What she finds …. well, you will have to read the story to find out what happens. This was a real page turner of a book with a lot of twists and turns. There are a number of storylines but they all are woven together with great skill by Ms. Swan. There are issues of family – both Flora’s and the mysterious Vermeils. They are the family who now own the apartment. I am somewhat intrigued by this choice of name as vermeil is basically gold plated – or bonding of 22kt gold on to sterling silver. It’s stronger than gold plate, but it’s not real gold. Intentional? You will find out, just as I did. Just be sure to set aside a block of time because once you start you won’t be able to stop reading.